BCD is an acronym for Bolt Circle Diameter. It’s the measurement (diameter) of an imaginary circle passing through the centers of all the bolts in a round pattern – like chainring bolts that hold the rings to the crank. On some cranks, like 4 bolt cranks, it’s fairly easy to measure, but for road and cyclocross with 5 bolts, it’s not so easy. Here’s the cheat sheet. BCD defines the positioning of the chainring bolt holes diametrical location. In layman’s terms, it’s the size of the mounting for the chainrings, and it must match for the crank and chainrings or they won’t mount up. 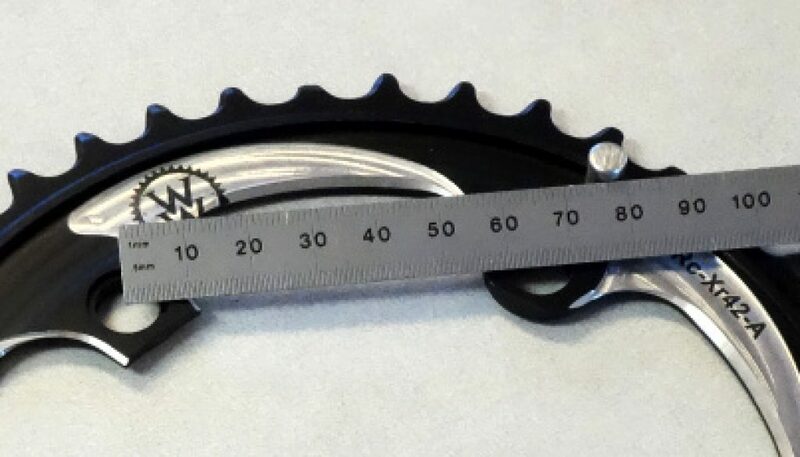 On 4 bolt cranks (those with 4 arms on the crank spider — typically on Mountain Bikes) the measurement can be pretty simple — just measure directly across the diameter. On 3 or 5 bolt cranks, measurements can be a little more tricky. (5 bolt cranks are typically used with Road and Cyclocross bikes, though not always). First, for bicycle cranks, there is the number of bolt holes – usually 4 or 5. Second, there are some specific increments that are typically used — 104 mm, 110 mm, 130 mm, etc. — which are different for the 4 verses the 5 bolt patterns. NOTE: This discussion assumes the bolt holes are evenly spaced. Some cranks (newer road cranks from Shimano and Campy) are not spaced evenly — they have 4 bolts, but the spacing between them is not even. Measuring between the holes will give an erroneous result. For those, you have to measure across. These 2 keys make it easy to create a cheat sheet to correlate an easy measurement with the actual bolt circle diameter. Just measure the distance between the CENTERS of two adjacent holes on the crank or the chainring like shown in these photos. The measurements do not need to be exact. The parts are exact, but if you just get close on the measurement, then you can find the value in the table fairly easily. Next, count the number of holes, then use the table below to figure out the bolt circle diameter (BCD) of your crank or chainrings. As an example, if you measured 2 & 1/2″ between holes, on a crank with 5 bolts, by looking at the table under ENGLISH Measurement Between Holes — correlated to 5 Bolts in Circle — you’ll see several numbers and 2.55″ is very close to your measured 2.5″ so you’ll guess correctly that it’s a 110 mm BCD. The specification for BCD is pretty easy when there is only one Bolt Circle on your crank. Most road and cyclocross doubles have just one BCD where both the large and small ring mount. However, that is not always the case. On triple cranks, and on most mountain 2×10 (and 2×11) set-ups, there are 2 Bolt Circle Diameters — one for the large ring (or rings), and one for the small chainring. In this case, they are usually designated as something like 104/64 BCD. That means 104 mm bolt circle diameter for the larger ring, and a 64 mm diameter for the smaller ring. Other common multi-circled (if that’s a proper word) sizes are 120/80 BCD for SRAM style mountain 2×10’s and 130/74 BCD for Road Triples. Finally, the designation of 4-bolt and 5-bolt is pretty obvious when there is only 1 bolt circle, but these designations also carry through when there are multiple bolt circles because there are 4 bolts or 5 bolts on each circle — even though they actually have 8 or 10 total bolts. 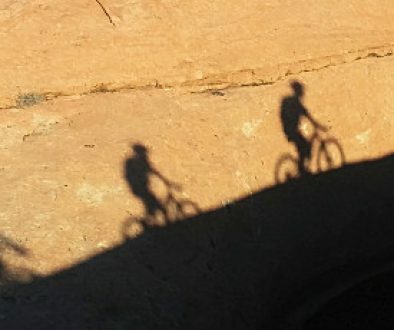 Look at the photos and compare to your crank or chainrings. Find the number of bolts in the circle (Left Column) and the approximate measurement (metric or English) between adjacent holes. Find those numbers in the table, then in the Right Column you’ll see the Bolt Circle Diameter (BCD). 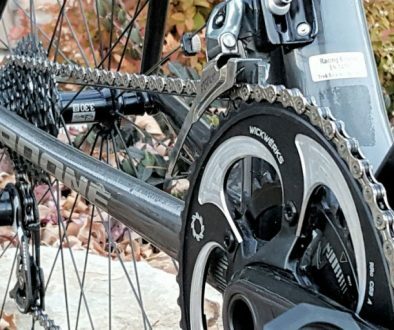 Use this information to buy the correct chainrings for your bike. Again, Please NOTE: This applies ONLY when the bolt holes are evenly spaced. It will not apply, for example, to the newer 4-bolt road cranks from Shimano and Campy because the holes are not spaced evenly. These newer cranks also have a bolt circle diameter, but you’ll need to measure directly across opposite holes to get it — not, as shown in the cheat sheet, center-to-center on adjacent holes.